BUENOS AIRES (Reuters) - Argentina, which defaulted on its debt again in July amidst a decade-long legal battle with a group of U.S. investment funds, welcomed on Sunday the inclusion of a clause in a G20 summit communique aimed at helping sovereign debt restructurings. The South American country argues that the process of restructuring its debt following its record 2002 default has been upended by a small number of junk debt experts it says are willing to cripple an economy in their pursuit of huge profits. It defaulted this year after a U.S. court ruled in favor of two U.S. hedge funds which bought Argentine debt on the cheap, rejected the terms of bond swaps in 2005 and 2010 and then sued the government for full repayment. In making his original judgment, the judge, Thomas Griesa, cited the "pari passu" equal treatment clause for creditors. He barred Argentina from servicing debt owned by the 92.5 percent of investors who accepted losses until it settled with the U.S. firms. Argentina denigrates the funds as "vultures". 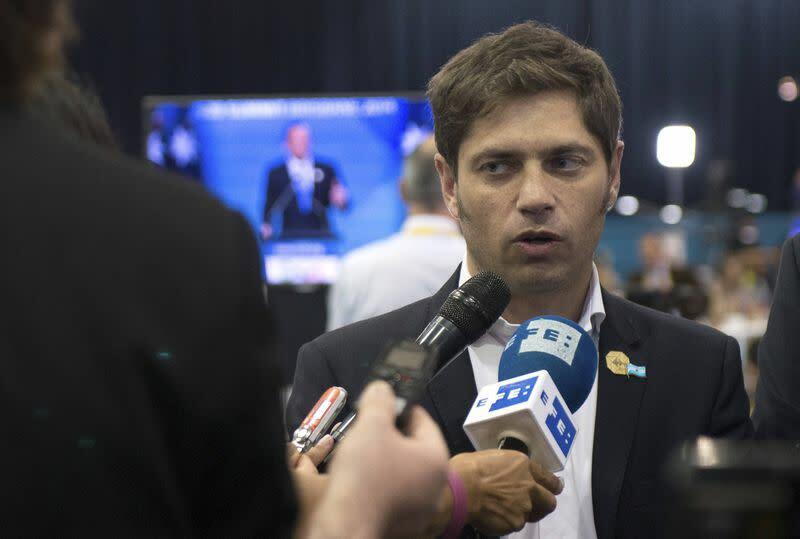 In Brisbane, Argentine Economy Minister Axel Kicillof welcomed the final G20 statement, which recognized the need to strengthen the "orderliness and predictability" of sovereign restructurings, and the challenges of litigation to the process. "We are extremely satisfied", Kicillof said in comments posted on the government's YouTube page. "Argentina denounced the actions of vulture funds and this is something that should be taken up by the leaders of countries because the truth is that limiting the reach of speculators ... must be a constant concern of the G20." In October, the International Monetary Fund (IMF) urged a rethink of how sovereign bonds should be structured to avoid future debt restructurings turning into a repeat of Argentina's disruptive court battle with a few disgruntled creditors. The IMF called for more robust so-called collective action clauses -- aimed at making restructuring agreements binding on all bondholders -- to remove the risk of some investors shunning debt workouts and taking legal action for years to squeeze cash from the debtor. The G20 called for the inclusion of strengthened pari passu and collective action clauses in international sovereign bonds.